The WWE and the Premier League have a surprising amount in common. Both are unpredictable, action-packed and full of emotion. Each is intensely high-stakes and has a roster of ambitious, larger-than-life characters. They can also both get seriously weird. For instance, do you remember when the WWE featured a tag-team match that pitched Vince and Shane McMahon against Shawn Michaels and...God? Just watch that video – you can't help but agree with commentator JR when he remarks: "This is insane." And what about that time Mae Young 'gave birth' to a hand backstage? Had JR been commenting when this took place, he'd probably have mentioned that it was a little crazy, too. As for the pinnacle of English football, in what other elite sporting league would a tipsy TV chef grab the mic from the club announcer to yell "let's be 'avin you" at fans. In no other elite sporting league. And in what other elite sporting league would a self-proclaimed "fascist" petulantly push a referee over after being sent off? In no other elite sporting league. It gets weirder when the two come together – which isn't as rare as you might think. Because the stars of these fantastic, bizarre sporting worlds keep colliding, producing situations that are sometimes awkward, and often strange. Here are some of the best. Let's start with the pinnacle of football-wrestling crossovers: when Wayne Rooney slapped massive, sweaty wrestler Wade Barrett in front of 20,000 people in the Manchester Arena. When WWE Live visited Manchester, Rooney decided to attend with his son. Maybe he told people it was for the boy's entertainment, but we get the feeling Wayne enjoyed the experience considerably more. Look at him in this picture. Has anyone at a live WWE event ever been this happy? Has Wayne Rooney ever been this happy? That is far from the only question we have. Do you reckon Rooney's son was proud of his dad after seeing him meekly slap an enormous man on international TV? Did Rooney have a script, or is he just riffing and pointing wildly as he goes along? Why are all of Rooney's responses completely out of time with what Barrett is saying? Could this have been Rooney's idea? Please say it was Rooney's idea. Please. After all, we're well acquainted with Rooney's track record in hand-to-hand combat – it must have been Rooney's idea. Look at Wayne Rooney's face – that's nothing other than the face of a guy who wants to semi-slap an enormous human in front of 20,000 people, and a television audience of umpteen million. It's the most exciting thing he did in all of 2015. 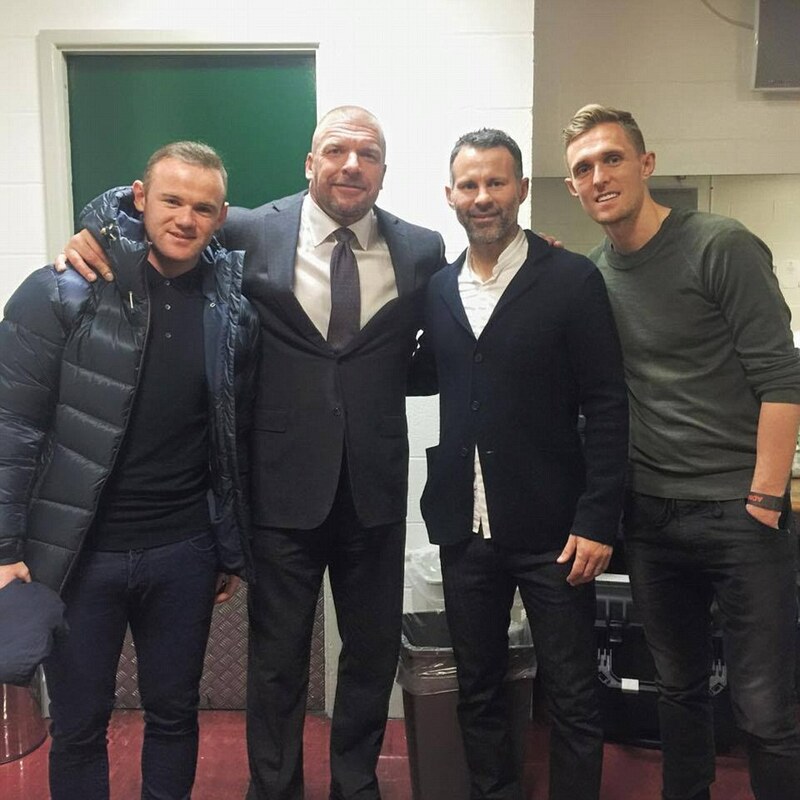 According to 13-time world champion (and Hammers fan) Triple H – pictured here, without his neck, alongside Wayne Rooney (that guy again) and Ryan Giggs – Andy Carroll should be a wrestler. Speaking to ITV, Triple H said of Carroll, "He is tall, likes to play it tough with the opposition and has the right looks with the long hair. He could be interesting." Triple H has a point. There's already one Geordie in the WWE, Neville (real name Benjamin Satterley), and if Carroll joined up it would be the next (small) step in the 'Geordiefication' of the whole WWE network. I think we're on to something here. This is how we can save professional wrestling: put more Geordies in it. Just imagine Andy Carroll's post match interview after he (inevitably) wins the Intercontinental Championship. 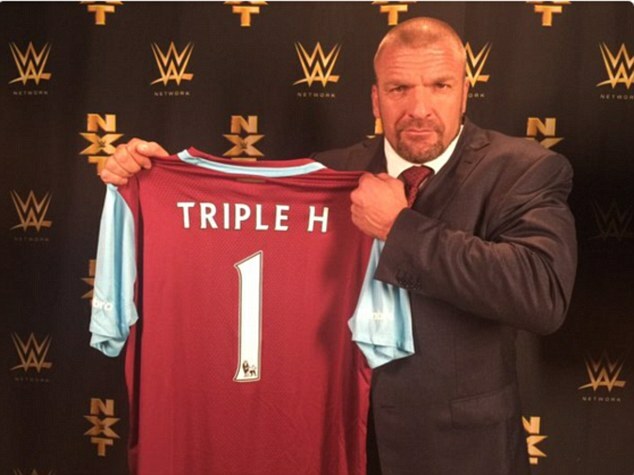 It turns out that Triple H isn't the only Hammers fan from across the pond. Remember Kurt Angle? What will always stick in my mind is not that Kurt Angle is an Olympic champion, or a six-time WWF/E champion, or a six time TNA champion, but that's he's a filthy fair-weather fan. Just look at these pictures. Here is Kurt Angle, looking a little bemused, maybe a little scared (isn't that Kurt Angle stare intense? ), clutching a West Ham shirt. Fair enough, right? Good for him. Respectable club. BUT THEN HERE HE IS AGAIN, now grasping a Cardiff shirt with his grubby, treacherous fingers, sporting that very same faraway facial expression. Awful, yes, but these photos make me curious: why are both so similar. You could be fooled into thinking that this is just one picture, photoshopped with different kits, but these are two entirely unique photos. The truth seems to be that Olympic gold medallist Kurt Angle just defaults to that sort-of bemused, sort-of stimulated, very terrifying stare when a camera gets up in his face. Could it be possible that Kurt Angle is just stood in football club gift shops with that same pose, and that same expression, all of the time? Does Kurt Angle just stand there, completely still, as people slot in and out, placing their favourite football shirts into his claws for a quick snap? Getting heckled by strangers is never fun. But, if you're a professional footballer, and especially if you're Fabian Delph, you just have to get used to the chants and jeers. It's part of the job. Stuart Tomlinson, former keeper for League One side Burton Albion, was regularly a victim of such chants. Look at this video, subtly titled 'Fat Burton Albion keeper Stuart Tomlinson pie song'. Chants of "your arse, is a roundabout" were probably a little demoralising. So Stuart – who is also a bodybuilder – jacked it all in. And what is he doing now? He's become a professional wrestler, of course, rechristening himself Hugo Knox. It's an odd post-football career move – not exactly punditry, is it? More body slamming an enormous adult through a table on TV. What could have provoked Stuart to make the switch? Well, when asked what it's like moving to work in Florida, Stuart said: "The sun is shining every day, I'm not on a pitch where it's raining and you've [not] got fans calling me fat." So there's your answer. The chants from Wimbledon fans, although made in jest, were so hurtful that the man moved to another continent to jump off ladders. Do you remember that time Dimitar Berbatov met Vince McMahon? Me neither, but just look at the state of this. Vince McMahon gives so few fucks in this photo that he can't even be arsed to raise his thumb up properly. This photo, this meeting, means nothing to Vince McMahon. I would share my theory about how Vince McMahon (if you put his hundreds of millions of dollars aside) is essentially one of those pumped up, overly aggressive P.E. teachers we all knew from school, or why – if you watched that video of McMahon versus God earlier – he's a bit mental. But then Vince McMahon, despite getting on a little bit, could easily crush my little head like a grape. So, because I'm a coward, I'll just mention what great shape he's in instead. Did I mention what great shape Vince is in? Next up, here's a video of John Cena hanging around in the Spurs dressing room with former manager Gerry Francis. My favourite thing about this video is that John Cena, for a couple of seconds, thinks to himself, "Yeah, I might try and pretend that I care about soccer. Anything to get people to spend more money of pay-per-views." As the video starts, Cena says, "This is a big game between two rival teams." True. It is. You can't fault Cena there. So far so promising. Next, he's asked why he's actually here in the UK. His response: "Just a PR tour". The man could only keep up the illusion for around seven seconds. John Cena finds it so difficult to pretend he likes football that, a mere two questions into the interview, his façade just collapses. Believe it or not, Soccer AM used to be half decent. The Saturday morning talk show has brought on a fair few wrestlers in its time, but the best was when The People's Champ, The Rock, dropped by the studio, where he was promptly converted into a Macclesfield Town fan. When the news reached the club, they made him a season ticket holder. In this video, filmed in Macclesfield, a family friend of mine (1:39, he's called Peter) jokes that The Rock donated a kidney to his brother (he's called James) – which brought out a hearty laugh from the most electrifying man in all of sports entertainment. It might seem like some silly joke that The Rock (a man who, if his Instagram is to be believed, is always incredibly busy) would have soon forgotten about. Surely it's a long shot, a dream, to believe that The Rock, an all-round perfect human, would remember Conference Premier side Macclesfield FC. Right? But The Rock does remember Conference Premier side Macclesfield FC. Here he is, years later, still saying that his favourite football team (at the 1:35 mark) are "the pride of Cheshire. You know who they are." None of us needed further proof that The Rock is a perfect human, but there it is.